LARGE SELECTION OF USED CARS IN NEW MEXICO! AND IT JUST GOT 20 TIMES BIGGER! 1Toyota of Santa Fe now has access to used inventory by over 20 other dealerships owned by RFJ Auto Partners. IF YOU DON’T LIKE IT, BRING IT BACK. YOU HAVE 7 DAYS TO EXCHANGE YOUR PRE-OWNED VEHICLE! 27 day exchange policy limited to pre-owned Vehicles Only. Maximum of 200 miles additional on vehicle from when it was purchased. Customer responsible to pay .50 cents per mile plus any wear and tear on the vehicle. Toyota of Santa Fe has the right to refuse under certain circumstances. Subject to change without notice. IF WE DON’T HAVE WHAT YOU WANT, WE’LL HELP YOU TO FIND IT! 3With over 20 dealers in our group, we have access to a huge selection of new and used inventory. So if we don’t have what you want, we will help you to find it. BUDDY #4 WE BUY CARS! WE WILL BID TO BUY YOUR USED CAR, TRUCK OR SUV EVEN IF YOU DON’T BUY OURS! 4No Cost Appraisal. No purchase necessary! NO HASSLE IN HAVING TO SHOW AND SELL YOUR VEHICLE TO A STRANGER! CERTIFIED QUALITY INSPECTION PLUS A CARFAX HISTORY REPORT ON EVERY USED CAR WE SELL! 5Toyota of Santa Fe employs certified mechanics, many with over 10 years of experience. NO CHARGE DELIVERY OF ANY CAR YOU BUY ANYWHERE IN THE STATE! 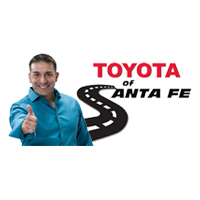 6Toyota of Santa Fe will deliver any vehicle purchased online anywhere in New Mexico. Limited to initial delivery of the vehicle after purchase. See dealer for details. WE SHOP OVER 25 FINANCIAL INSTITUTIONS TO GET YOU THE BEST RATE. 7ALLY FINANCIAL, AMERICREDIT, ANIMAS CU, BANK OF AMERICA, BANK OF THE WEST, CAPITAL ONE, CARFINANCE, CHASE CUSTOM, CHASE PRIMECITIZENS ONE, CRESCENT BANK, DEL NORTE CU, FLAGSHIP, GATEWAYONE, KIRTLAND FCU, PRESTIGE, PRIME ACCEPTANCE, RIO GRANDE CU, SANDIA AREA FCU ,STATE EMPLOYEES CU, TD AUTO FINANCE, TOYOTA FINANCIAL SERVICES, US EAGLE FCU, US BANK, WELLS FARGO, WESTLAKE FINANCIAL, ZIA CREDIT UNION., See Any Toyota of Santa Fe Salesperson for details. SHOP AT YOUR CONVENIENCE. SIMPLY DIAL 6 IF YOU GET A RECORDING. NIGHTS! WEEKENDS! HOLIDAYS! 8Dial 6 if you get a Recording to get a live salesperson. Shop online. Most of our salespeople are available 24/7. TYPICALLY OVER 30 CERTIFIED USED VEHICLES ON THE LOT! 9Based on online posted certified Toyota inventory as of 6-22-18. OPEN EARLY FOR SERVICE AND LATE FOR SALES! 10Service open from 7am-6pm weekends and from 8am -5pm on Saturday. Sales open until 8pm during daylight savings time! 11a Our Toyota Sales & Service Professionals are required to take regular training to maintain their certifications. Most of our staff has ten years experience or more. Most dealerships strive for at least one master mechanic. We have four! 11d. Toyota Awards: Many of our staff have received special awards from Toyota. Such as Maria Espinosa for Customer Relations. Toyota of Santa Fe Received the Presidents Award in our first year as a new dealership. Toyota Presidents Award is recognized annually for Toyota deals that excel in all facets of their operations. 11b Best of Santa Fe: As awarded by The Santa Fe Reporter based on votes received. Toyota of Santa Fe was named the “Best of Santa Fe” in the car dealership for 2015, 2016, 2017 and 2018. TOYOTACARE! CERTIFIED USED! USED WARRANTIES! 12 Any used vehicle without a warranty and under 120,000 miles comes with a minimum 6 months or6000 miles, whichever comes first. Minimum warranty comes with parts and labor up to $2000. Parts and labor up to $2000 for the next 6 months or 6000 miles, whichever comes first. All used vehicles, including those over 120,000 miles come with a 7-day exchange policy. Maximum of 200 miles additional on vehicle from when it was purchased. Customer responsible to pay .50 cents per mile plus any wear and tear on the vehicle. Toyota of Santa Fe has the right to refuse under certain circumstances. Subject to change without notice. All New Toyotas come with ToyotaCare! LARGE SELECTION OF USED CARS IN NEW MEXICO! AND IT JUST GOT 26 TIMES BIGGER! 1Toyota of Santa Fe now has access to used inventory by over 26 other dealerships owned by RFJ Auto Partners. 3With over 26 dealers in our group, we have access to a huge selection of new and used inventory. So if we don’t have what you want, we will help you to find it. 5Toyota of Santa Fe employs certified mechanics, many with over 10 years of experience.Typipcally over 100 1-owner vehicles in stock. TYPICALLY OVER 20 CERTIFIED USED VEHICLES ON THE LOT! 9Based on online posted certified Toyota inventory as of 11/15/16. 10Service open from 7am-7pm weekends and from 8am -5pm on Saturday. Sales open until 8pm during daylight savings time! BEST OF SANTA FE! CERTIFIED STAFF! 11b Best of Santa Fe for 2015, 2016, 2017, 2018 As awarded by The Santa Fe Reporter based on votes received in that year. Toyota of Santa Fe was named the “Best of Santa Fe” in the car dealership category. In 2018, Toyota of Santa Fe also received best car repair in Santa Fe. 12 Any used vehicle without a warranty and under 120,000 miles comes with a minimum 6 months or 6000 miles, whichever comes first. Minimum warranty comes with parts and labor up to $2000. Parts and labor up to $2000 for the next 6 months or 6000 miles, whichever comes first. All used vehicles, including those over 120,000 miles come with a 7-day exchange policy. Maximum of 200 miles additional on vehicle from when it was purchased. Customer responsible to pay .50 cents per mile plus any wear and tear on the vehicle. Toyota of Santa Fe has the right to refuse under certain circumstances. Subject to change without notice. All New Toyotas come with ToyotaCare!